Diggerland USA, the construction-themed adventure park in West Berlin, NJ is teaming up with JCB, a world leader in construction equipment manufacturing, to race the world’s fastest backhoe in Englishtown, NJ. The 38th annual US Diesel Truckin Nationals takes place September 13 at Old Bridge Raceway Park. The event is a celebration and display of diesel innovation and hosts a series of diesel race lineups, Monster Truck Thrill Shows and an exhibit of 2,000+ diesel big rigs and machines. 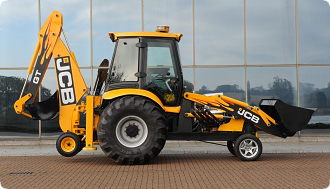 Diggerland, in partnership with JCB, will be on location displaying a series of modified construction machines currently in use as rides and attractions at the theme park. Making its first appearance in the North America Racing circuit since 2012, the JCB GT, a 1300-horsepower backhoe, is scheduled to run the quarter-mile during the event. In addition to providing the majority of modified equipment used in Diggerland’s attractions, JCB has made history by building and racing the World’s Fastest Backhoe, reaching speeds up to 100 mph. The US Diesel Truckin Nationals take place from 9:00 AM to 10:00 PM Saturday, September 13. Media interested in covering the JCB GT race should contact Dave Napp with Old Bridge Township Raceway Park at 732-446-7800. Read our first impressions of Diggerland USA here!